Results from this year’s Empyrean Annual Enrollment survey indicates HR leaders’ growing interest in consumer-driven plans, as well as the need to maintain strategic control to adapt to rapid business changes. Benefit teams are being increasingly challenged to balance strategic responsibilities, compliance requirements, and demands for more engaging experiences – all while facing a multitude of administrative tasks. These trends illustrate how employers are managing this balance. As demonstrated by these top trends, companies are looking to drive efficiency, increase engagement, and realize strategic agility; using smart, modern, and consumer-friendly technology is key. Benefits move fast, and employers must remain flexible and ready for inevitable (and sometimes unexpected) changes. In fact, 83% of respondents have changed their benefits strategy within the last three years. This figure illustrates the serious need for employers to ensure they have the freedom to alter their strategy and keep ahead of potential curves and remain successful in their goals. One of the most important elements in retaining strategic control is your benefits administration technology platform – the very system responsible for carrying out your strategy. Is your benefits administration technology responsive and agile enough to help you manage shifting trends, demands, and responsibilities? Does your provider dedicate the right time and resources to efficiently administer your solution, and ensure you receive support from experts that are well-versed in your specific solution, strategy, and goals? Looking on your own experience, how do you expect your strategy and benefits offering to evolve in the near – and far – future? Are you confident that your current processes and technology will be capable of sufficiently meeting and managing your needs over time? By working with a proven partner equipped with a carrier- and strategy-agnostic platform, powerful decision support and communication tools, and a client-focused organizational structure, you can rest easy knowing that your benefits program will be continuously supported, no matter what comes next. 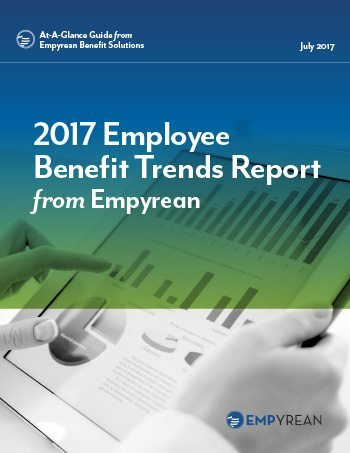 We invite you to download Empyrean’s newest At-a-Glance Guide for an in-depth look at the top benefit trends impacting HR today. This free guide explores these factors to help inform and improve your own benefits strategy and execution. As you read, we’d love to get your thoughts. Feel free to contact us with questions or comments at info@goempyrean.com.